I have a couple guitars with nut slots not deep enough for nice action. I have been looking around for some nut files but they were pretty expensive. somewhere on the internet I read someone mention using welding tip files to cut the slots. They are used to clean the tips of oxy acetylene torches. I went out and got a cheap set ~$6. They worked great. not too aggressive, but cut just right. anyway, I am not sure if this has been mentioned here before. Thank you very much! I've been seeking for a while for a cheap alternative to files. Stewmac sells a set of files for ridiculous amount of money. you kind of have to get the hang of using them, because they bend a little, but they worked great. the initial factory slots were there, but if you are working from scratch, it may be best to get the groove going with a jewelers saw or small file first. Never would have thought of those in a million years. Great tip! Plus, you never know when you're gonna need to clean some oxy acetelyne torches... Best be prepared. Sort of seems like some of the stuff on Stew Mac are just existing tools that have been repurposed into something guitar related and upcharged. Their "nut and saddle" vise is just a basic vise you can find in any hardware store. FWIW their nut files are apparantly great to use, and if you are a professional luthier, then they are essential. 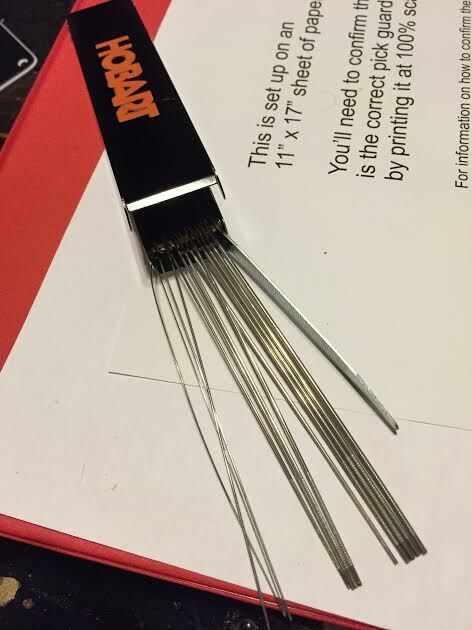 My nut files came as a kit with some other tools and cost �25. They do the job better than the torch cleaners, but not as well as the Stewmac files. The torch cleaners are great for tidying up an existing nut, not so good at making a new one. You are absolutely correct. Their fret wire tang nipper is just a nibbler with a groove cut for the fret wire to sit in. I purchased a nibbler and cut a groove with my dremel tool. Saved about $40.00. Those welding files look like they would be great for smoothing out or opening up bridge slots as well. And their fret pullers are just wire end nippers that have been filed flush so the cutting edge lays flat with the fret board. Arr, been using a set of those for the last few years.